LOS ANGELES, USA -- We assign the people who fight our wars to a special category. We call them “soldiers,” and one of the primal effects of placing them in uniform and training them to kill is to set them off from the rest of society. But when you watch the tumultuous documentary “Breaking Point: The War for Democracy in Ukraine,” you see a war — a full-fledged revolution — fought by ordinary citizens. They are men and women, without military backgrounds, who have made a decision: that safety, stability, even the love they feel for their families is not as important as preserving their country’s freedom. They didn’t plan to be soldiers — war was something they chose, and something that happened to them. They’re engaged in a battle with a quintessential oppressor: the force of Vladimir Putin, who has made it his mission, in Ukraine, to sow the seeds of chaos, and to erode the very notion that Ukraine possesses an independent national identity. “Breaking Point,” directed by Mark Jonathan Harris and Oles Sanin, is a close-up of the volcano, an impeccably made story-of-a-siege documentary that shows you how a revolution evolves, step by step, into a collective writhing being. When we think of historical uprisings — like, say, the American Revolution — the events are often so baked in mythology that it’s difficult to place yourself in the shoes of ordinary citizens who took up muskets and had absolutely no idea how it was all going to turn out. In “Breaking Point,” a revolution begins with a spontaneous surge of student protest, which took place in November 2013 in the Maidan (pronounced myden), the sprawling Independence Square in the middle of Kiev. The students were protesting the corruption of Ukraine’s president, Viktor Yanukovych, who had come to power in a democratic election but was still an authoritarian puppet of Putin’s who looted the country and greased the wheels for the Russian invasion of Crimea. The movie immerses us in the protest, which looks every bit as civilized and middle-class as the May 1968 uprisings in Paris — that is, until the police arrive and start to bash heads. The next day, a much larger throng — people of every age — turn out in the Maidan. They will not tolerate state-sanctioned violence. But we’ve seen these kinds of protests spring up before, in Tiananmen Square or Tehran, only to see them quelled just as quickly. In Ukraine, as the days of rage go on, they become a cauldron that transforms the people, who start off as protesters but literally begin to see themselves as freedom fighters. That, of course, all sounds quite valiant (which it was), but the transformation wasn’t simply about rising up. It was about what the people now felt they would give up: their security, the whole existence they had known. The war that was to come — their war — would destroy lives (at this point, more than 11,000 Ukrainians have died in it), and it would also eat away at souls. “The war took away our soft parts,” says one still rather gentle-looking, pipe-smoking citizen-soldier. In “Breaking Point,” the investigative journalist Tetyana Chornovol, who looks like a Ukrainian Sally Hawkins, asks: Would you sacrifice your family for your country? It’s a haunting question to contemplate, and Chornovol goes on an odyssey of immersion worthy of a tragic thriller. She is interviewed extensively in the film, and comes off as a compelling talking-head witness to history. But she was also at the center of an incident that struck an international nerve: In Dec. 2013, after she published an article on the personal wealth of Ukraine’s Interior Minister, two cars with mysterious agents chased her on the highway (we see her riveting dashboard-cam footage of the attempt she made to elude them), and after driving off the road she was beaten mercilessly. The photographs are horrifying, yet her battered features became a face of the revolution. She was later elected to Parliament — where, as part of the system, she was now looked upon in some quarters with skepticism: the merciless side of revolutionary commitment. Why did, and do, the Ukrainian citizens possess this fervor? The film sketches in the astonishing history of Ukraine: a land of splendid black-earth fertility that has been invaded for centuries by the people who surround it (the Mongols, the Poles, Turkey, Russia), as if the country were literally being ravaged for its riches. In the early ’30s, Stalin starved millions of Ukrainian farmers to crush the country’s dream of independence; Hitler viewed Ukraine as a bread basket that would fuel his empire. 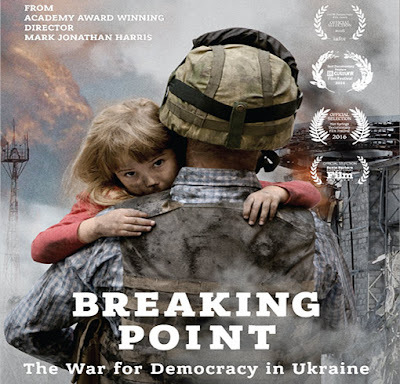 “Breaking Point” demonstrates, with chilling perception, how the Ukrainians today are up against more than assault rifles and rocket launchers. They’re facing a torrent of Russian fake news — what we used to call propaganda, though it has now achieved a fluid viral insidiousness. The notion of an independent separatist movement is a meme that became a reality through repetition. Yet it has been energized by Putin’s stealth campaign of occupation, and it remains, to a degree, a mythology. We see footage of the battle of Crimea, where Putin hired local criminals to act as “separatist” thugs. He took the region, but more important he created an optical illusion. Beyond their nation’s proud, tormented history, Ukrainians grasp that their pushback against Putin carries a special destiny. The historian Anne Applebaum explains how the Russian attempt to re-conquer this nation, beginning with Crimea and then moving into Eastern Ukraine, eerily mirrors the Soviet grab of Eastern Europe that began in 1945. She says it’s really the tip of the spear in Putin’s war against the West. One emerges from “Breaking Point” stunned and moved, with the realization that the Ukrainians are fighting for themselves, as they have for centuries, but also that they’re now fighting for all of us.